For a while Tuesday morning, it appeared that Congress and the White House could quickly reach an agreement to avert a partial government shutdown ahead of Friday’s funding deadline. But within hours, negotiators appeared back at square one. Lawmakers have until Dec. 21 to come to an agreement on how to fund the departments of Transportation, Housing and Urban Development, State, Interior, Agriculture, Treasury, Commerce, Homeland Security and Justice, as well as other independent agencies. Otherwise, most of these entities would be forced to shut down some or all of their operations and furlough at least some employees. President Trump and congressional Democrats have been at loggerheads over the Homeland Security Department portion of the spending bill. Democrats insisted on allocating no more than $1.3 billion for general “border security” in the appropriations bill, while Trump insisted that he would be “proud to shut the government down” in order to secure $5 billion in funding specifically for a proposed wall along the U.S.-Mexico border. But during an interview with Fox News Tuesday morning, White House Press Secretary Sarah Huckabee Sanders announced that President Trump would be willing to back down from his $5 billion demand, and would instead accept a bill that provides only $1.6 billion in border security, suggesting the administration had unspecified “other ways” to re-allocate funds from across the federal government to go toward wall construction. Later that morning, Senate Majority Leader Mitch McConnell offered a new proposal to Democrats, but was rebuffed. That plan would have adopted Democrats’ offer of $1.3 billion, but also provided the White House with what Democratic aides called a $1 billion “slush fund” to be used for immigration enforcement. On Monday, Senate Appropriations Committee Chairman Roy Blunt, R-Mo., indicated that congressional Republicans were stuck in a holding pattern, waiting for Trump to indicate what he would be willing to support. 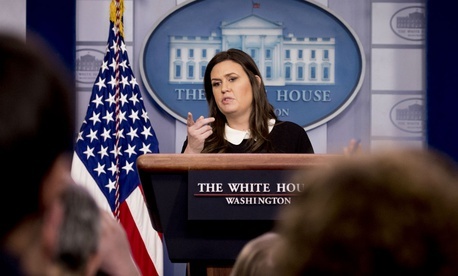 But in a press briefing Tuesday afternoon, Sanders turned that back on lawmakers, insisting that the Senate must act first before the president could determine what he would sign into law. Sanders said that in the meantime, Trump has asked all agency heads to find money that could be re-allocated without congressional approval to go toward wall construction. She did not explain where that money would come from or how they could avoid running afoul of the Antideficiency Act, which prohibits agencies from spending money in excess of appropriations without congressional approval. “The president has asked everyone to look for funding to protect our borders and give the president the ability to fulfill his constitutional obligation to protect the American people and have a secure border,” she said.